The Tetragrammaton יהוה represents our window of understanding of Hashem through His transcendance and compassionateness. There are eleven times that the Torah uses the term וירא, meaning appeared with reference to Hashem, יהוה. Here the ו has the patach nikud indicating that it acts as a conversive converting the future tense to the past tense as well as having the meaning of the conjunction and or the adverb then. 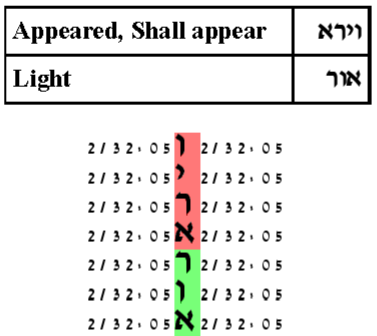 There is one time the Torah uses the term וירא, meaning shall appear with reference to Hashem. Here the ו has the shevah nikud indicating that it just carries the meaning of the conjunction and. There is one time that the Torah uses the term וירא not in a reference to Hashem. In that instance it is to Joseph who after many years appears to his father Jacob and falls on his shoulders. Appearance, in the sense used in the Torah has to do with light. Therefore, it is natural to pair the key word וירא with the key word אור, light. With expected number of ELSs set to 10, as shown below, there is a small skip ELS pair in a minimal configuration. For this expected number of ELSs, the maximum skip for each ELS is 2. This is the skip of the minimal configuration. The probability that a text from the ELS random placement text population would have such a minimal configuration is 54.5/1,000. So from this point of view it is perhaps somewhat unexpected. The cylinder size is 2 columns. The expected number of ELSs was set to 10. This is the smallest possible configuration. The probability that a text from the ELS random placement text population would produce such a smallest possible configuration is 54.5/1,000.